Find all things Paddington Bear at Paddington Station. Collectors and superfans: if you want to spend money on your hobby, London can help with that. Here are some of the best specialist, dedicated toyshops the capital has to offer. 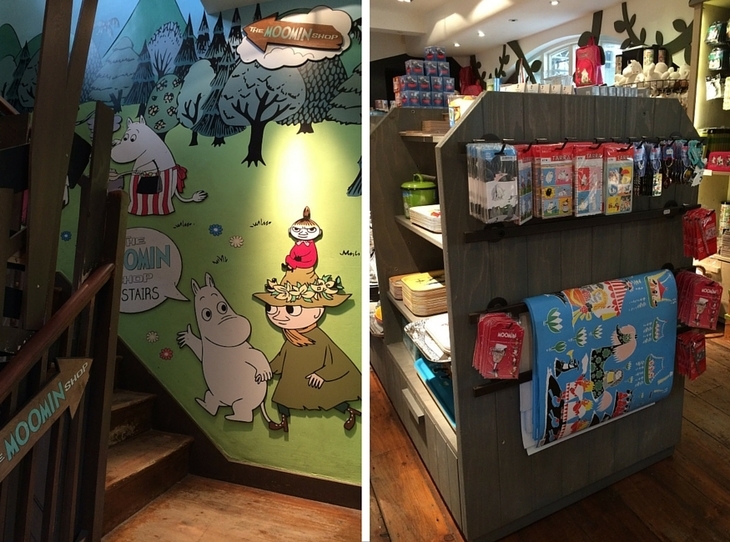 The Moomin Shop in Covent Garden. Photos: Author's own. Fans of the hippo-like eco-warrior trolls will love this Covent Garden treasure trove of Tove Jansson's creatures. The Finnish artist's 1950s creations are cute and collectable: look out for books, gadgets, towels, baby clothes, stationery and rare memorabilia. We like the strangely poignant coasters. Or you could splash out on a limited edition £199 handmade enamel and copper pill box. The shop itself is a recreation of Moomin Valley, complete with Moomin Forest and Moomin Cave. And the merchandise is all laid out in little blue Moomin houses. Twee rating: 7/10. Sweetly sentimental but there's a frosty Finnish edge running through all the Moomin stuff. 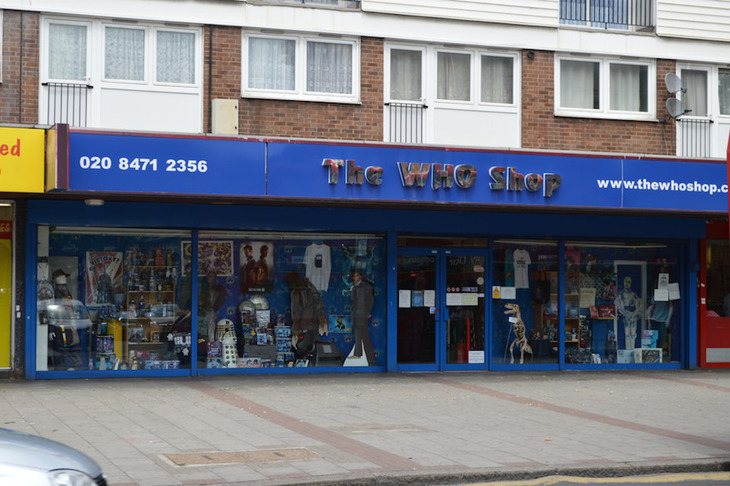 The Who Shop. Photo by Matt Brown via the Londonist Flickrpool. Whovians should take a trip out to Zone 3 to visit this cornucopia of Doctor Who treasures, including books, comics and DVDs. It's the place to go for your replica sonic screwdriver, Dalek earrings or a TARDIS timeline t-shirt. 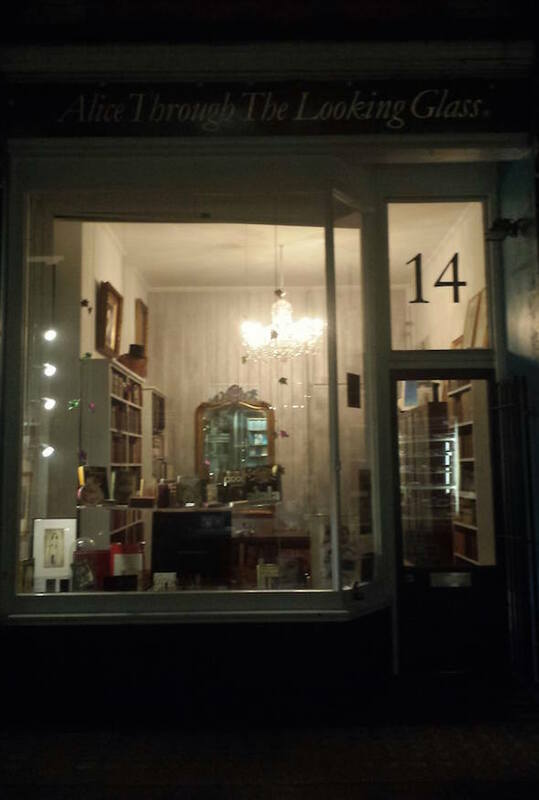 The shop is run by husband and wife actors, Kevan and Alexandra; Kevan has even appeared in Doctor Who shows over the years. Attached to the shop is a small museum for the uber-fans: for a small fee, you can browse more than 100 different objects from sci-fi film and TV shows with an expert guide. Twee rating: 2/10. Doctor Who is a lot of things, but it generally avoids tripping into twee territory. Plus, Daleks are fricking scary, even in replica. 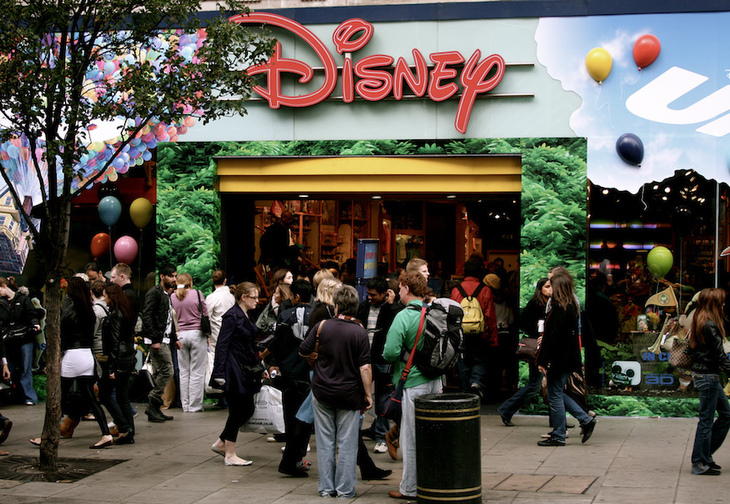 Europe's largest Disney store. Photo by Pierre Mallien via the Londonist flickrpool. Hit the Disney Store 10 minutes before the doors open for the chance to take part in the daily excitement of the 'Opening Ceremony': where one child is given the chance to open the shop with a special golden key. Once inside what's actually the largest Disney Store in Europe, look out for the animated trees, pixie dust trail and magic mirrors activated by Disney Princess wands. There are 'plushie mountains' (or lots of cuddly toys if you're a Brit), a fairy castle, and limited edition Disney couture (yes, really). If you're lucky, you might time your visit for a special 'Imagination Explosion', when the lights dim and children are handed bells to ring before Disney villains take over the various animations overwhelming decorating the shop. Tinkerbell comes to the rescue, replacing villains with heroes, and there's a music and 'firework' display when she's 'won'. 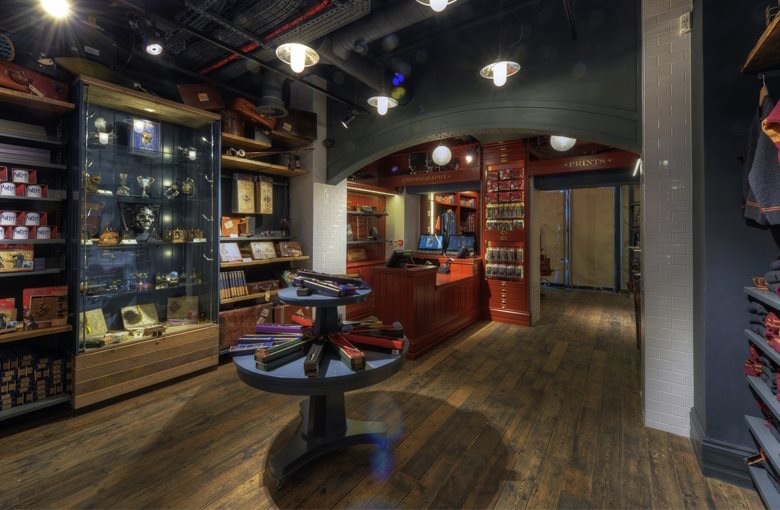 The Kings Cross-based Harry Potter shop nods to the Diagon Alley retail aesthetic. Fans eagerly awaiting London's new Harry Potter stage show can indulge in their passion in Kings Cross in the meantime. The Harry Potter Shop at Platform 9 3/4 is the place to be if you need some Bertie Botts Every Flavour Beans, a new Gryffindor scarf, or a Dobby doorstop. Kudos to whoever thought up the Muggle mug (£8). Alternatively, a gold- and silver-plated Quidditch chess set will set you back £230. The store nods to the authentic Diagon Alley shopping experience, with plenty of dark wood, mysterious drawers, wizardy artefacts and wands. Another station shop with an apt location: pop into Paddington Station to gorge on all things Paddington Bear. Since the arrival of the Ben Whishaw-voiced celluloid version of the Peruvian orphan in 2014, Paddington has been en vogue again, hence this new shop. As well as beautiful books and artwork, you can also buy cards, cuddly toys and crockery. And a Keep Calm and Eat Marmalade Sandwiches cushion, should you need one. 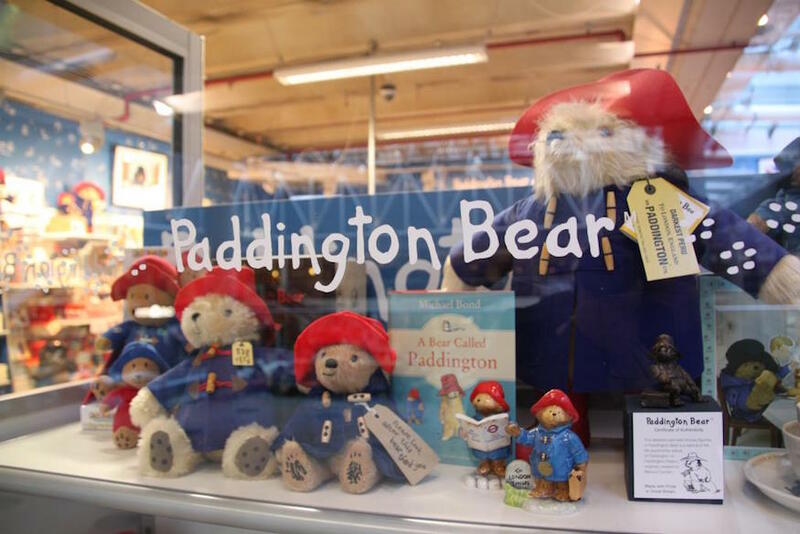 Paddington pedants will notice the shop offers memorabilia featuring red hatted, black hatted and yellow hatted ursids: the former being Paddington's latest wardrobe; the latter being the colouring of the teddy that first inspired Michael Bond. Twee rating: 4/10. Cushions aside, the rest of the Paddington Shop is marvellously British: reserved and restrained. 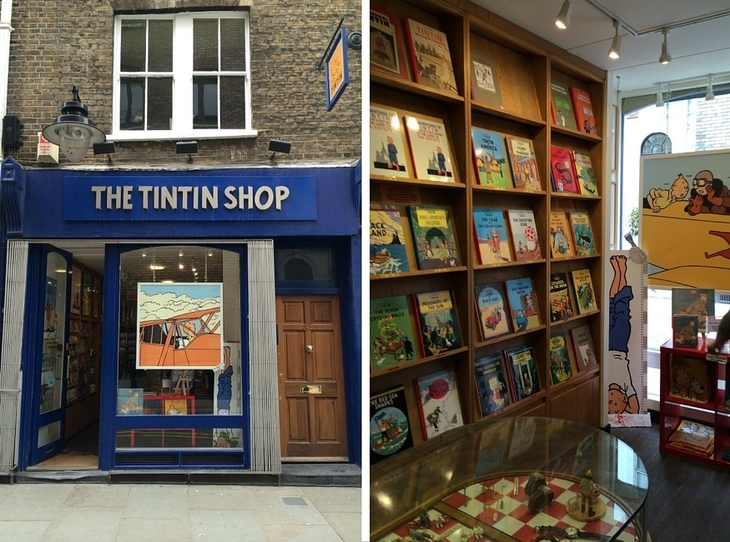 Tucked away in a Covent Garden side street is a tiny emporium dedicated to the Belgian boy reporter and his fellow Herge creations. As well as all the books, there's some tres chic stationery, great large-graphic t-shirts, key rings, crockery, posters and some beautiful models. The resin rocket currently dominating the shop's display will set you back a few hundred pounds. We rather like the Tintin height chart: little 'uns can measure how tall they are compared to the young bequiffed hero. Twee rating: 10/10. We're thinking of adding a picture of one of these toys' faces to the dictionary, under the entry for 'twee'. The unique Alice Through The Looking Glass in Cecil Court. Down Westminster's warren-like Cecil Court, you'll find a wonderland of Alice-inspired collectibles at Alice Through The Looking Glass. As well as first and early editions of both Lewis Carroll's Alice books, you'll find framed illustrations, limited edition prints and chess pieces. An overriding Alice-aesthetic inspires an Alice Looking fashion range, vintage Victorian top hats, original Fillmore Jefferson Airplane posters, Bobby Fischer chess books, and Op Art originals. Look out, too, for Harley, the resident thoroughbred British Giant White rabbit, who lives in the shop window, with burrows connecting him to further living quarters beneath the shop frontage. Twee rating: 1/10. Twee hunters? Nothing to see here.